Braden Speed took his own life Oct. 30, 2018. 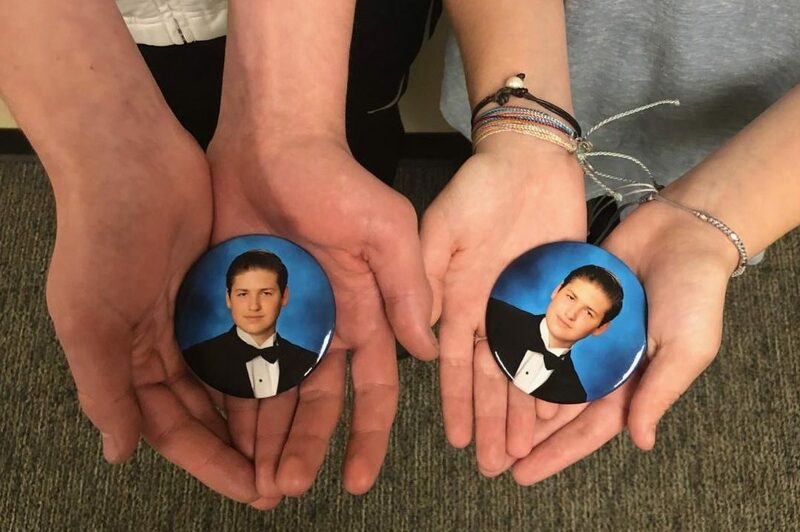 Holding a button featuring Braden's yearbook photo are his voice team members Greg Valek and Courtney Yates. "He was going through a tough time," Valek said. "I feel like if I knew him I could have helped, and I don't want that to happen again." Students nominated up to three students last week they believed they could trust in a time of struggle. Students nominated numerous times will be notified of their acceptance into the Hope Squad program and will begin the appropriate training process. This article was originally published on Feb. 1, 2019. Administrators will be traveling to Utah next weekend, Feb. 20-22, to see if they further plan to bring Hope Squad to Prosper. 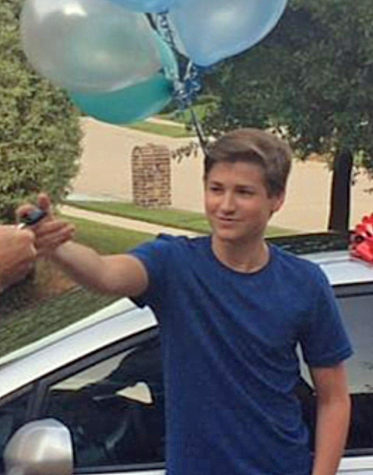 After a long time of struggling, 18-year-old Braden Speed took his own life Oct. 30, 2018. 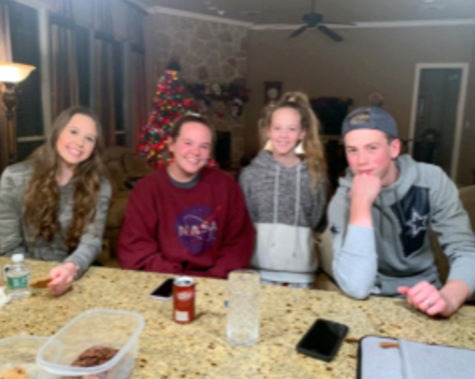 Students Hope Rasberry, Greg Valek, Kailee Walters, Laurissa Miller, Ashlyn Stokes, and Courtney Yates – along with members of the Speed family – now work to eradicate the isolation students can feel through forming the Braden’s Voice Team. They are working to bring a program called Hope Squad to the high school. Hope Squad started at a high school in Provo, Utah plagued with suicide. Utah has a suicide rate 2.5 times higher than the U.S. average. Their principal called for change and brought in psychology students from a local college to start the Hope Squad. The Hope Squad members in Utah were selected by a student ballot. Administrators distributed ballots to every student. The sheet asked kids what student they would go to if they were having a hard time. They discovered about 40 names that rose to the top of the list, which formed the Hope Squad. These students then trained on how to handle others’ situations as well as how to support them. The same process and training will happen in Prosper. Each student who is a part of Braden’s voice team has been impacted by suicide, whether they have been through a dark time themselves or have had friends close to them who have dealt with suicidal thoughts or actions. In the past four years, Prosper has experienced four students leave this world via suicide. Provo was able to put Hope Squads in 31 out of the 41 school districts in Utah, and administration is now helping it make its way to Prosper. Since the loss of their son, the Speeds have been dedicated to making sure no one feels alone. They’ve started opening their home on Sunday nights to those who need a place to talk and to be with others to make a space for the relationships their son needed. With the world of social media being so prominent in students lives it can sometimes make it easy to feel alienated. Braden’s father is dedicated to making sure his son did not die in vain. In December 2018, Mark Speed started a blog called Braden’s Voice. He shares Braden’s stories and his family’s struggles since their loss. The blog has reached more than 20,000 people in the U.S. and has been viewed in 49 countries. Hope Squad, or another effective program like, is projected to become an active part of Prosper after February 2019. According to Burdett, administrators are looking for an option that does use a student-led effort to establish the relationships kids like Braden needed. The Prosper "Out of the Darkness Walk" took place Nov. 3. The American Foundation for Suicide Prevention raises funds through awareness walks in every state. "We should start having more of these walks and organizations," senior Piper Wise said. "We can do more during mental health month to bring awareness and start having more mental health education in our schools." 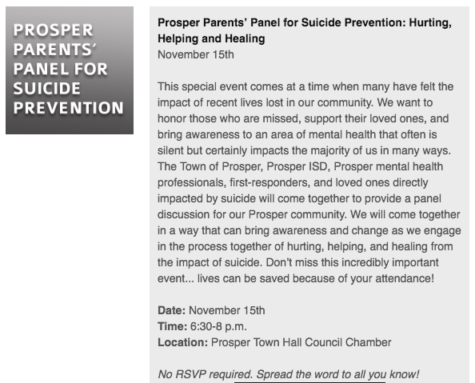 The “Prosper Parents Panel for Suicide Prevention: Hurting, Helping, Healing” event will take place in the Prosper Town Hall Council Chamber, today, Nov. 15. The American Foundation for Suicide Prevention, which raises funds for scientific research, public education and support for survivors, will sponsor a “Survivor Day” event in Dallas, Nov. 17. 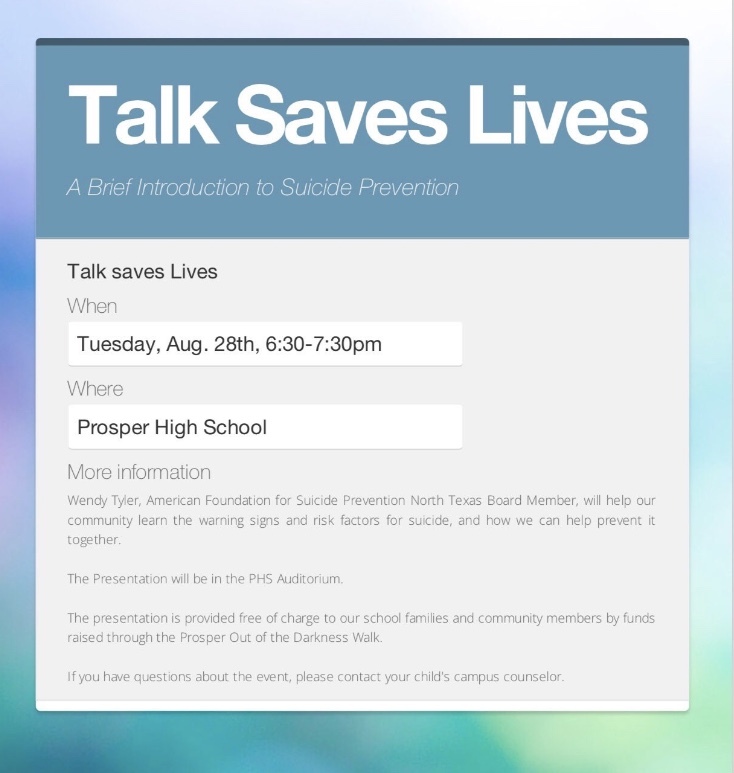 Today’s event, sponsored by the Prosper Parents’ Panel for Suicide Prevention, will run today from 6:30-8 p.m. 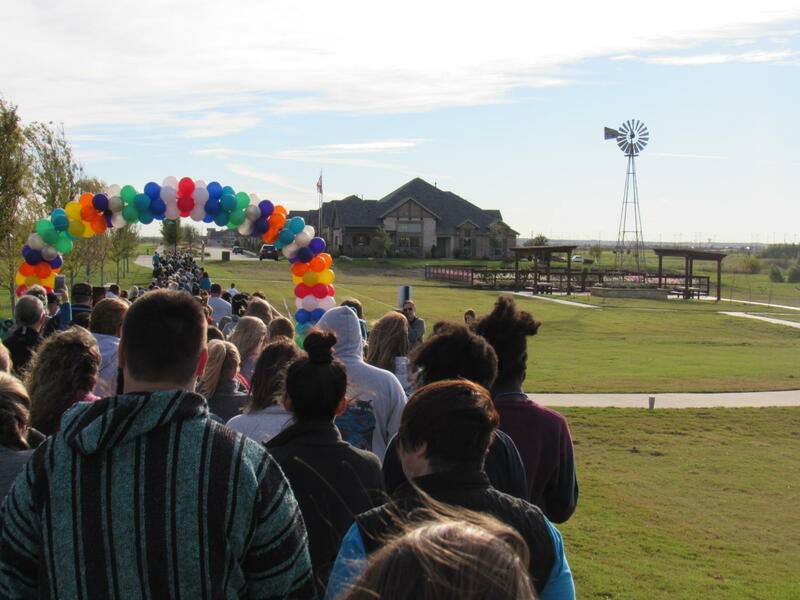 The Nov. 3 “Out of the Darkness” walk held in Prosper’s Windsong Ranch, raised $40,733, for the AFSP’s outreaches. The group had set a goal of $35,000. The first national “Survivors of Suicide Day” began in 1999. The organization’s programs are funded through charitable donations, like those received as a result of the “Out of Darkness” walk. For those who can’t afford to donate money, the AFSP offers other ways to support the organization, like participating in a fundraiser walk. The organization offers several programs for teenagers and adults. There are several ways to get involved and take action, like the awareness walks and prevention programs. Wise believes that students should be doing more during mental health awareness month, participating in awareness walks, and getting more education on prevention. For information, on the event tonight, see the following resources supplied by the Prosper Parents Panel for Suicide Prevention flyers. The American Foundation for Suicide Prevention provides informatiom for those who want to keep their friends and family safe. Today the ‘Talk Saves Lives’ presentation on warning signs and risk factors for suicide will be held at 6:30 p.m. in the high school auditorium. AFSP North Texas Board Member Wendy Tyler will speak at today's event. “So many people are unaware of how prevalent suicide and attempts are with our teenagers,” Tyler said. “In the United States, it is estimated between 100 and 200 teenagers attempt for every one suicide death that occurs. It’s not more common in low-income areas than in high-income areas. It is across the board.” People can visit the AFSP website for more information. The ‘Talk Saves Lives’ presentation on warning signs and risk factors for suicide will be today, Aug. 28, at 6:30 p.m. in the auditorium. American Foundation for Suicide Prevention North Texas Board Member Wendy Tyler will talk about suicide prevention and awareness as well as answer questions parents have. Attending the presentation will be free of cost to community members by funding raised through Prosper’s ‘Out of the Darkness’ walk last November. This diagram was given by AFSP North Texas Board Member Wendy Tyler for additional information. “Warning signs have to do with the way people talk, drinking, taking drugs or moods. These things need to be taken seriously,” Tyler said. People can visit the AFSP website for more information. Tyler said students who have suicidal ideations can be from all different backgrounds, and it’s not only because they’ve had a bad day. “One of the things I will talk about tomorrow is how so many parents see their teenagers and how they may have gone through a breakup, didn’t get into the college they wanted to or that there was some precipitating factor and don’t know all that went on before,” Tyler said. “There could’ve been underlying issues as well. It’s never just one cause. Senior Lauren Moss had a friend who ended his life her sophomore year. She attended the high school until her junior year when she moved to McKinney Boyd High School. 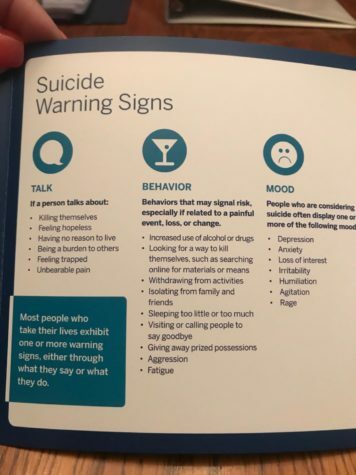 Moss said it is important for parents to learn warning signs now so their kids can receive help because in the cases she’s seen about teenage suicide, the parents never saw or understood the signs. Senior Piper Wise also said she sees people make jokes about ending their lives more often than not. The message Moss wants to let teenagers know is that everything does get better, whether or not they believe it yet. The National Suicide Prevention Hotline is 1-800-273-TALK. Tyler has also included her email, tylerfamily7@gmail.com, if people have questions or need to talk. Such a wonderful thing to do. So many kids need this. Kids don’t realize that you are only High School for such a short time and then it is a whole new world with College and Work. If we can just get them through the hard times in school. What your doing will hopefully save other kids. God Bless all of you that are trying to help kids who feel alone. Haley, you did an outstanding job in capturing our story and mission. God is real and very much at work here. Thanks for being part of that! Heading to Utah Feb. 21. Hope is on “The Way”. Awesome outreach! Let’s go back to old fashioned way of getting to know someone. Let’s validate each other daily. Let’s continue to share our successes and look at the good things in life. No mater how small they may be to another person, they are important to an individual suffering with depression. Keep on sparking the lives of others! We lost our beautiful 17 year old son, Chandler Fetterolf on May 30, 2017 to suicide. He was a junior at Prosper High School. I’m so thankful Hope Squad is being implemented. I wish there would have been a program like this in place prior to the loss of our son. God is truly at work and I pray this will help save lives in the future. Thank you to this amazing group of kids who are stepping up to make a difference.